Across the nations surveyed, the level of concern about different international issues varies considerably by region and country, and in some places multiple issues vie for the top spot. Publics in 19 of 40 nations surveyed cite climate change as their biggest worry, making it the most widespread concern of any issue included in the survey. A median of 61% of Latin Americans say they are very concerned about climate change, the highest share of any region. And more than half in every Latin American nation surveyed report substantial concerns about climate change. In Peru and Brazil, where years of declining deforestation rates have slowly started to climb, fully three-quarters express anxiety about climate change. Sub-Saharan Africans also voice substantial concerns about climate change. A median of 59% say they are very concerned, including about half or more in all countries surveyed. Climate change is particularly worrying in Burkina Faso (79%), Uganda (74%) and Ghana (71%), while South Africans (47%) and Tanzanians (49%) are the least concerned. Both regions are especially vulnerable to the effects of climate change, as is Asia, where a median of 41% voice great concern about the issue. Indians (73%) and Filipinos (72%) are particularly worried, but climate change captures the top spot in half of the Asian countries surveyed. Concern about climate change is relatively low in Europe. While a median of 42% report being very concerned, global climate change is not one of the top two threats in any European country surveyed. Anxiety about this issue is highest in Spain (59%), but just 14% in Poland say the same. In a number of European nations, concern about climate change is more pronounced for those on the left of the political spectrum. Ideological differences are particularly large in the United Kingdom, where about half of those on the left (49%) express serious concerns, compared with 30% of those on the right. Those to the left of the political center are also considerably more concerned about global climate change in Italy, France and Spain. Global climate change ranks substantially lower as a comparative global threat for Americans, with 42% saying they are very concerned about the issue. The only global issue that is even less worrying to Americans: territorial disputes between China and its neighbors (30%). Much like in Europe, perceptions in the U.S. about the threat of climate change depend on ideology. About six-in-ten Democrats (62%) are very concerned about climate change, while just 20% of Republicans say the same. Fear of ISIS in Europe, Middle East and U.S.
Publics in 14 countries express the greatest concern about ISIS, the militant group seeking to create an Islamic state in Iraq and Syria. In Europe, a median of 70% express serious concerns about the threat posed by the growing organization. Apprehension is greatest in Spain (77%), but anxiety about ISIS is high throughout the continent. Even in Poland, where just 29% voice serious worries, fear of ISIS is second only to worries about tensions between Russia and its neighbors. As ISIS continues to control territory in Iraq and Syria, concern in neighboring countries is high. More than eight-in-ten in Lebanese (84%) are very concerned about ISIS. Fear is especially high among Muslims in Lebanon, Syria’s western neighbor: 90% of Sunnis and 87% of Shia say they are very concerned, compared with 76% of Christians. More than half in Jordan (62%) and the Palestinian territories (54%) also express substantial worries about ISIS. Compared with other international issues, concern about ISIS also ranks highly in Israel and Turkey, which has seen a flood of refugees across its southern border as violence escalates. A majority of Americans (68%) and Canadians (58%) are also very concerned about the looming threat of the Islamic State. In both countries, anxiety about ISIS is the top concern of the issues included in the survey. Concern is similarly high in a number of Asian nations, including South Korea (75%), Japan (72%), Australia (69%) and Indonesia (65%). Publics in all four countries cite ISIS as their top concern. Relatively few in Africa and Latin America voice serious concern about the threat of ISIS. Only in Tanzania do roughly half (51%) report substantial concerns, the highest of any country in either region. While concerns about climate change and ISIS take the top spots in an overwhelming majority of the countries surveyed, the most frequent secondary concern around the world is the instability of the global economy. A top concern in five countries, including Russia, the economy is the second highest concern in 20 countries. Economic instability is among the top threats in Latin America, where a median of 54% express serious concerns. Six-in-ten in Brazil and Venezuela say they are very concerned about economic issues, the highest in Latin America. Both nations have seen little to no growth in the past year, and their economic woes are expected to deepen in 2015. Economic worries are similarly troubling for countries in Africa. Ghanaians (67%), Ugandans (62%) and Senegalese (59%) are most concerned about the economy, but economic instability is considered one of the top two concerns in every country surveyed in Africa. Russia and Ukraine, which are facing contracting economies in 2015, consider economic instability a major threat. In Russia, 43% say they are very concerned about the economy, the highest-ranking concern of any issue tested there. About a third of Ukrainians (35%) agree; economic worries are second only to their concerns about tensions with Russia. The economy is somewhat less concerning in Europe, Asia and the Middle East. Still, a third or more in each region say they are very concerned about global economic instability, and the issue still ranks as the second-highest threat in seven countries, including some of the world’s largest economies – China, France, India and Italy all rate economic issues as one of their top two concerns. Israelis are the only public surveyed to rate Iran as their top concern among the international issues tested. More than half of Israelis (53%) have substantial concerns about the threat posed by Iran’s nuclear program. Israeli Jews (59%) are far more likely than Israeli Arabs (23%) to express anxiety. Americans also see Iran’s nuclear program as a major issue. Roughly six-in-ten (62%) say they are very concerned, making Iran the second-highest-ranked threat of those included in the poll. While a median of 42% of Europeans express strong concern about Iran, only in the UK is it considered one of the top two dangers. Relatively few in Latin America, Africa, Asia and the Middle East say they are very concerned about Iran’s nuclear program. Worldwide, the threat of cyberattacks on governments, banking or corporations does not resonate as a top tier worry, though there are pockets of anxiety. In particular, worries about the systematic hacking of computer networks are highest in the U.S. (59%) and South Korea (55%), both of which experienced high profile cyberattacks in recent years. Fewer than half in every other country surveyed express serious concerns about the threat of cyberattacks. Concerns about tensions between Russia or China, and their respective neighbors, are largely limited by geography. Just 24% globally are worried about tensions between Russia and its neighbors, but in Ukraine (62%) and Poland (44%), both former Soviet bloc countries, Russia ranks as the top concern. This anxiety is high among Ukrainians and Poles from all walks of life. Within Europe, the British (41%) and Germans (40%) consider tensions with Russia to be one of their top two concerns, second only to fear about ISIS. Elsewhere, relatively few are concerned about tensions with Russia. Similarly, while there is little concern worldwide about territorial disputes between China and its neighbors, it is one of the top two concerns in a number of Asian nations, including Vietnam (60%) and the Philippines (56%). Both countries challenge China’s claim over islands in the South China Sea, where the Chinese government has recently constructed artificial islands. 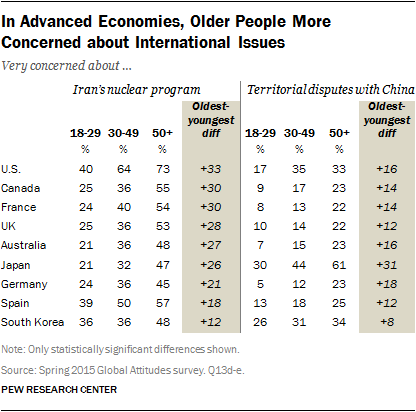 In most countries, there is little variation by age in concerns about international issues. However, in most advanced economies surveyed, people ages 50 and older are more likely to say they are very concerned about a range of issues compared with their younger counterparts, including the threat of ISIS, Iran’s nuclear program, territorial disputes between China and its neighbors, cyberattacks and tensions between Russia and its neighbors. In Canada, a majority of those ages 50 and older (55%) express serious concerns about Iran’s nuclear program, compared with just 25% of 18- to 29-year-olds. Similar differences exist in the U.S., France, the UK, Australia, Japan, Germany and South Korea for nearly all of the issues tested. Only on the issue of climate change is the opposite true in the U.S. – younger people (46%) are significantly more likely to voice concern about climate change than those ages 50 and older (36%).